...I have to say, unless you've read and enjoyed JoJo's Bizarre Adventure Part 3, this probably won't make much sense. No, scratch that. Any sense. 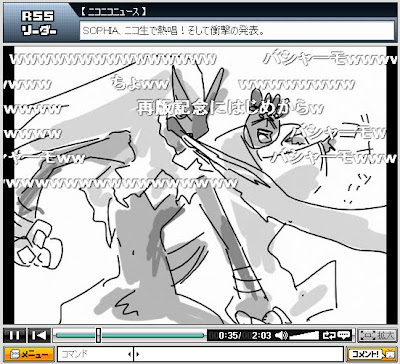 This is basically one guy drawing the Stardust Crusaders part of JoJo's as he remembers it, complete with stunning (?) voice overs and astounding (??) sound effects. Enjoyment factor of this probably hinges more on knowledge of Stardust Crusaders' story than actual Japanese knowledge, though of course the more you understand, the more injokes and conversation you'll get. As the title says, the humor comes from the artist's hilariously patchwork memory, sometimes mixing and matching events, often reinterpreting them completely. Also cameos from Dio that I coulda sworn weren't in the original. How did he fit in there? Now there's some fridge logic for you. What's pretty impressive is that this guy's kept updating for over a year (started in January 2009; last update was March 7th 2010) with over 30 installments. And... well... I can't really describe it. You just have to see for yourself.